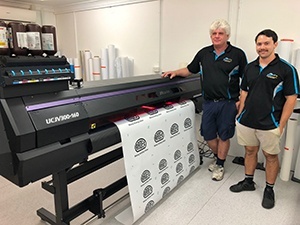 Bear Signs & Designs (Burleigh Heads QLD, Australia) | Mimaki user stories | Case Study | MIMAKI SINGAPORE PTE. 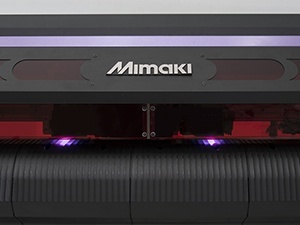 LTD.
Main reason for choosing Mimaki UCJV Series - LED UV Printer/Cutter platform? Garry comments; "Multi-layer printing and the application advantages this gives. Print speeds and the quality of the white solution. We are still experimenting with the features and get more and more impressed each day." What have you been most impressed with? The machine operation in general: ID Cut is a function to print together crop mark and ID for recognition of cutting details and media rotation of job and then cut data automatically. Multi Layer we are so impressed with, this give us so many different options for our customers. 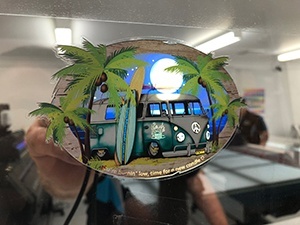 LED UV Curing technology opens up a wider choice of media solutions which is fantastic for our business. Garry explained; The UCJV300 has reached and even exceeded our expectations. We have saved money, helped move productivity in a different direction which is extremely important for us. We would strongly recommend the UCJV series from our experience with the Mimaki solution. IndustryWe owe our success to our loyal and happy customers. Our mission is to supply the best quality Service, Commercial Artwork Products at a very Competitive cost.